A second tenant, recently announced, is workspace provider Central Working. This company already has premises in other parts of London, Cambridge and Manchester. 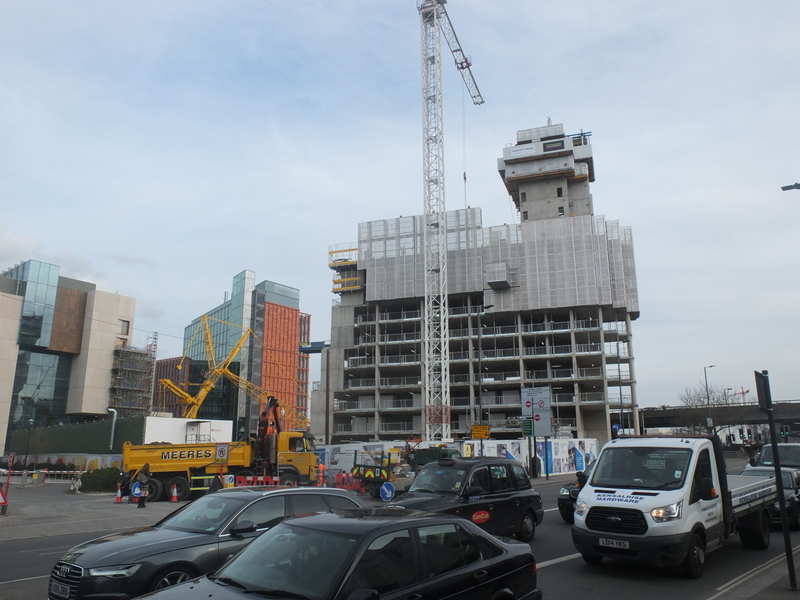 It remains to see whether all further tenants will add to the aspiration of creating of world-class scientific and biomedical cluster at White City, or prove to be more run of the mill commercial tenants. ‘Building C’ is the the Molecular Science Research Hub, housing research from Imperial’s Department of Chemistry. This building is at final fitting out stage, and can be seen on the left in the image below. We have great respect for the College’s track record as an academic body. We simply wish that it would not behave like an aggressive property developer when it comes to the planning and design of its buildings, and their impact on their neighbours. Work has also started on the Michael Uren Biomedical Engineering Research Hub, which will include new technologies for the early detection, monitoring and treatment of cancers and in regenerative medicine. Again the public benefits achieved by those who occupy the completed building will no doubt prove to be huge, but the College will have over-developed a smallish site and created a sunless ‘public’ square unlikely to prove of benefit to building users or the local community. Other ‘community benefits’ agreed to as planning obligations between Imperial College and LB Hammersmith & Fulham are proving slow to materialise. The most significant of these is the £4m cycle and pedestrian underpass, allowing a through route beneath the railway line for Shepherds Bush and North Kensington residents. The start date for this project has been pushed back first to 2017 and now to 2019, and there is growing concern that it will never happen. The residential tower will deliver 192 new apartments including 59 earmarked for Imperial key workers at below market rents. With many new residential towers in the sales and construction pipeline across London, we continue to query whether the apartments built for the market will be filled. House prices in Hammersmith and Fulham dropped by 2.3% between November 2015 and November 2016, and public concerns over air pollution have rocketed up the London agenda. An apartment overlooking the Westway roundabout, a pollution hotspot, will not be everyone’s first choice.